Defects and omissions. – Dirty wet dog , boats and sailing. Or to put it in simple laymans terms : the endless job list, remember that ‘WABI’ means “never finished, never perfect and never permanent” which is normal for boats . The weekend did give me a much better sailing , anchoring and living-aboard workout than just being out there in easy conditions so thoughout the weekend i made a series of notes in addition to my normal cruising log. I started this practice with my previous boat which was in many ways a more complex boat in that it had more systems ie a fixed diesel engine (and charging) a conventional rig with lots of sails, self steering etc. To my way of thinking the more systems and complexity we have the more jobs we create because everything will break or wear out if used or not and over time. 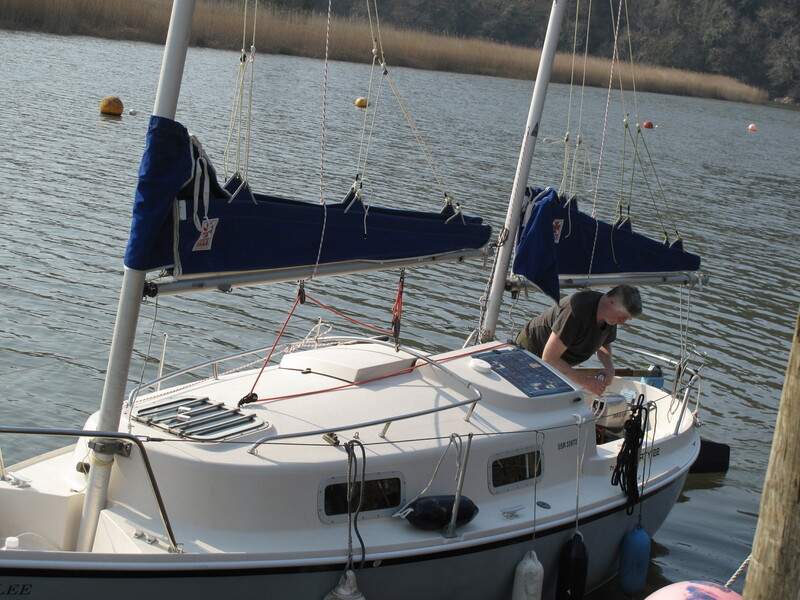 Some readers will know that i have spent time trying to be a professional sailor : one boat i would say needed 4 of us working nearly full time just to keep her basically clean and her tired engineering running on a minimal budget and waning enthusiasm. My side : endless cleaning so that the bilge didn’t smell of small dead animals and endlessly re-splicing her wire and rope halyards and re-seizing her 30 odd fist sized genoa hanks per sail. My closest mate then spent most of his time swearing at something in the engine space….i still fondly remember the night we blew up the genny !. A deliberate side of my boat choices nowadays are that i tend towards maximum simplicity /minimal systems and either low maintainence or the ability to do the essential work with minimal cost and difficulty. Ideally i would have it such that i could get the boat into my drive and save some hard cash : the problem there is that i would need to do some serious surgery to alter the access and neither do i have a trailer yet. I do have an advantage now in that the boat is only 10 minutes drive from home compared to nearly an hour with the previous house and boat distance and do have a decent workshop/mancave to work in. That means i can go down to the boat and either just measure up there and work back at base or bring parts back home and work on them…yesterday evening for example i had closed the boar up earlier in the day but found when i got home that the spray paint had arrived so just made the quick out and back to fetch the electrics cover box for its paint-job in the cave. This trip i spent a lot of time experimenting with the changes that i made over the winter and its those that are now getting the tweaks and changes to take the boat up one more notch : here is the kind of thing and how i think about this stuff. 1.Rig and sails. Neither sail now hoists quickly and easily by hand with the problems being : >Mains’l seems to stick in mast track. This might be due to having washed both masts when down (an the sails) and washing out the silicone track/slider spray. Solution : re-spray sail tracks (may require rigs down again) >Main halyard also seems sticky/draggy and not running freely especially during drop. Worst case scenario is that the halyard is running over and around the new in-mast wires which would mean taking the rigs out and re-reaving halyard or wiring. >Halyard winch always tends to over-wrap if halyard hauled manually. Winch is taken from the centreboard old arrangement and is a Gibb ST. The winch also tends to snag the halyard during a drop. Only real solution is to change out the winch for a conventional non self-tailing type. >New mainsheet seems to be too thick and stiff in light weather ie doesn’t run and trim cleanly when there is minimal sail pressure even with all new high-end blocks in the system : solution is to change the 9mm sheet down to a light 8mm sheet when funds allow. >New mains’l reefing not quite there yet : tack is easy to haul down but it is still difficult to haul down the clew and lash to boom from the companionway so may yet need a reef-line that runs from clew to gooseneck and back to cockpit (would need 3 new blocks) >Mizzen sheet too short but runs well, needs better arrangement for moving and securing tackle to windward or centre. 2.Anchoring. >4 different set-ups trialled during trip : Set-up 1 : 8kg D type with all nylon warp. Easy to deploy from stern but predictably needs a long scope (6:1) which didn’t work so well due to gusty conditions (boat sheers a lot) and needing to close-anchor under shelter. Solution was to try using anchor angel as previous..works ok but awkward and heavy to get forward and deploy off bow…usual hard-eye lizard didn’t work well with warp. >Set up 2 changed to 8kg D type with 1x boatlength of 8mm chain, better for close anchoring, sheering less. Problem is that the chain has to be deployed over the bow , not vie fairlead, fairlead would need rebuild with outer roller to take chain. More seriously this set-up did slowly drag in the harder conditions later on but maybe due to the soft silt bottom and the drag was slow. Possible problem is still excessive shearing as bow is pushed over by gusts. Ultimate solution is to go up one anchor size ie 10kg and use the 15 metres of 7mm chain. Weight on bow could then be a problem but could be solved by going to a stern recovery and cockpit stow when needed. >Set ups 3 and 4. Rocna 6kg set up with either weighted warp as kedge and with 15metres of 7mm chain as primary anchor and stern deployed. Stern deploy works well but needs a roller arrangement to throw rode clear of coaming and rub-strip. Stern anchoring is ok for easier conditions but doesn’t then easily allow mizzen hoist and hove-to position for hoisting main. Stern recovery is very dirty in cockpit when mud anchored. >Generic : friction is greater with warp running aft but not such that it becomes un-useable. warp aft does allow for pulling up to anchor much easier and for adjusting scope from aft. Bow fairlead does work well but needs new version with a bow roller in system to allow chain deployment over bow . Changes : >Consider purchase of ‘gold-standard’ anchor for boat ie 10kg Rocna at best. Set-up with 15m of 7mm chain in bow well and warp aft. Use stern recovery method when needing to get weight aft Need supply of cable-ties and spanner with anchor gear. >Set up 6kg Rocna as reserve anchor using scrap length of chain and weighted warp. >Design and build (or have made) new bow fairlead with double roller arrangement. Consider having SS or alloy fabrication. >Side deck primary cleat for bow anchor works well, needs GRP back-up under deck. Electrics. generally works well. >Make connect/disconect for compass board. >Need 1 interior light in heads and one spotlight forward. >Design and build set-up for stbd Solar panel. >Need high power floodlight/torch for night running on river. Deck safety. >Still awkward to go forward and still has high tendency to trip over ‘guardrail wires’ : consider removing all wire except run at cockpit, change that with thicker dyneema only and make detachable to allow side-deck paddling when needed. >Long term consider having cabin rail re-built but much higher as proper grab rail to make going forward more secure. >Improve cockpit and masts line stowage to remove trip hazard !. Previous Cruising logs : February. Can you put another grab rail inside the existing one ? might get to busy on the coach roof as I see the mainsheet track is part of the existing one and you probably don’t want to buy a Harken track to put in its place, you could find a second hand one and use a piece of rectangular ally tube to make a beam like I did with our boat don’t forget that you can machine ally with a router and wood work cutters messy, loud but it works. Then the hand rail can be a hand rail. I have a folding tri here at the moment and the owner wants retractable prod / bow fitting as it has neither, looking at doing some of it in ally and anodising it or possibly glass with a thin stainless lining in the bow roller area it does not need any weight up there, the hull is an awkward shape to match metal to so undecided yet thankfully its a winter job ! The way i am thinking is to have a higher rail like the ones on pilot boats (although not quite that high) and get rid of the tripwires. I can’t see that there is enough room for 2 rails as the original one would become redundant anyway. The central span is used for a traveller on many liberty’s. I have the simplest rope traveller, its actually a prussiked strop but its isn’r really necasary now as i don’t move it much now that i have a proper vang. I think what i want would be an easy project for a SS fabricator which is something we lack around here unless i can leave the boat near the pheonix works and they charge an arm and a leg. How about a couple of low hoops running across the boat with a fore and aft rail attached, the frames across give the stiffness without a load of bracing, you would need to pattern the areas of the deck where the feet go, tape deck with brown packing tape, green or blue masking tape first so you don’t end up with tape residue to remove, bog and attach some wooden framing to connect the whole lot together and make it stiff enough to remove to the man cave where the process is reversed to produce a pattern for the feet. then it can go anywhere to be made in the workshop a drawing should suffice for the rest. You must be on nights ! Late night working on the blog, just about to leave for the boat again for 2nd try. Catch you later. Hi Al. When i can get the photo’s up i will try and show you why i think that won’t work : one reason is that the forward mast needs to fold down back-ards easily but as i say i will try and photograph and do a longer post about a longer project re-organising the whole cabin roof as movement and the trollwinch catch me out again.